A swimming documentary was just released this past June called “The Last Gold,” about an American women’s relay team that raced just over 40 years ago in Montreal, Canada, at the XXI Olympiad. The story focuses on what we now know was an unfair competition between the drug-enhanced East German women and the rest of the world. It is a story of both triumph and tragedy, as the East German women swimmers were victims as well. There is an Oregon connection in this story. Kim Peyton, who grew up in southeast Portland, was lead off on this remarkable 4 x 100 freestyle relay. Truly amazing swimming, and against all odds they swam to Gold. Kim was a close childhood friend of mine, both in and out of the pool. She was born in Hood River, and moved to Portland early in life and learned to swim at the David Douglas High School pool. She excelled in school as well as in the pool. We became friends when I joined DDSC in 8th grade. We swam a lot, back in the days of massive yardage and little to no talk about swimming technique or swim drills. No goggles or cap either. 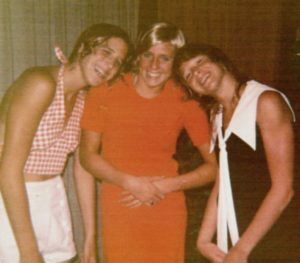 Outside of the pool we learned to sew in Home Economics (Wood Shop was just for the boys), and grew to love making clothes for ourselves – including hip-hugger bell-bottom pants that were a thing back then. Boys were a big topic of conversation. During the summers when yardage bumped up considerably we’d spend time together between morning and afternoon practices, eating, sewing, resting, eating and talking about boys. Swimmers can be ferocious eaters and so this story comes to mind. One day after morning practice we decided to go to Dunkin’ Donuts and buy a dozen each. Always the competitor, Kim finished her twelve and went on to help me with one of mine for a total of 13, versus my nine (we couldn’t get through the last two). Afternoon practice was a particularly tough one for us both! In 1972 we both qualified for the Olympic Trials held in Chicago. My time in the 200 free barely made the cut, but Kim’s freestyle times were fast and in the mix to make the team, particularly in the 100 and 200. In those days there wasn’t a 4 x 200 women’s relay, so the 100 free was the event where at least four swimmers would make the team. Kim didn’t finish in the top four, but made the team as an alternate on the fifth double (extra team spots made available when other swimmers make the team in more than one event). We were so excited!! In Munich, Kim swam the 100 free in prelims to help the U.S. women make it to finals, where they did win Gold. The East Germans took Silver and West Germany Bronze. Though the East Germans had a good showing in the 1972 games, their prowess evolved rapidly in the years that followed leading up to the 1976 games. At the Santa Clara International meet in June, 1973, I remember seeing the East German girls swim for the first time. Kim and I were intrigued by their different look, but honestly I’m not sure either one of us knew anything about anabolic steroids or doping. We were likely most taken aback by the fact the East German girls didn’t shave their arm pits. To dive forward to 1976, Kim made the U.S. Olympic team in the 100 free. In Montreal she set the American Record in the 100 free in finals, but was clearly disappointed at the wall with a fourth place finish. East German swimmers took 1st and 2nd place, and a Netherlands swimmer won the bronze. The physical changes the East German women exhibited, including exceptional muscle mass and low voices, were observed by other swimmers and coaches in Montreal, but for the most part not outwardly spoken about. The performances of the East German women swimmers reached a pinnacle at these Olympics. They not only won their first swimming gold medal in Montreal, but they also won Gold in all but one individual event – and Silver as well in several others. They were annihilating their competition, and crushing world records at every turn. The American women were frustrated. Going into the final women’s event, the 4 x 100 free relay, television commentators speculated about which team might get the Silver, assuming it was a foregone conclusion the East Germans would win Gold. 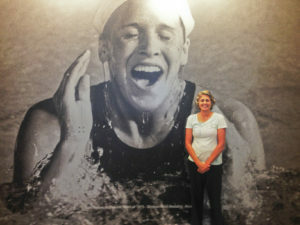 A greatly enlarged photo of Kim Peyton covers a large wall (floor to high ceiling) at the David Douglas pool. Karen is standing in the foreground. My family watched the relay at our house on TV, a few blocks down the street from the David Douglas pool where Kim had logged 100s of training miles. Though we had already received a phone call that Kim and “her” relay had won, we watched with tremendous excitement and anticipation! About 10 years ago Kim’s parents, Barb and Gene, brought a very old VHS tape to my house. Barb said it had been sitting up on the shelf in their closet for the past 30 years and she couldn’t bear to watch it. We watched in tears 30 years later as the U.S. Women were (again) victorious! 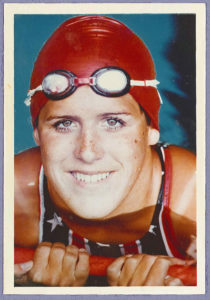 After the Olympics Kim went on to Stanford University where she swam and earned a degree in Journalism. 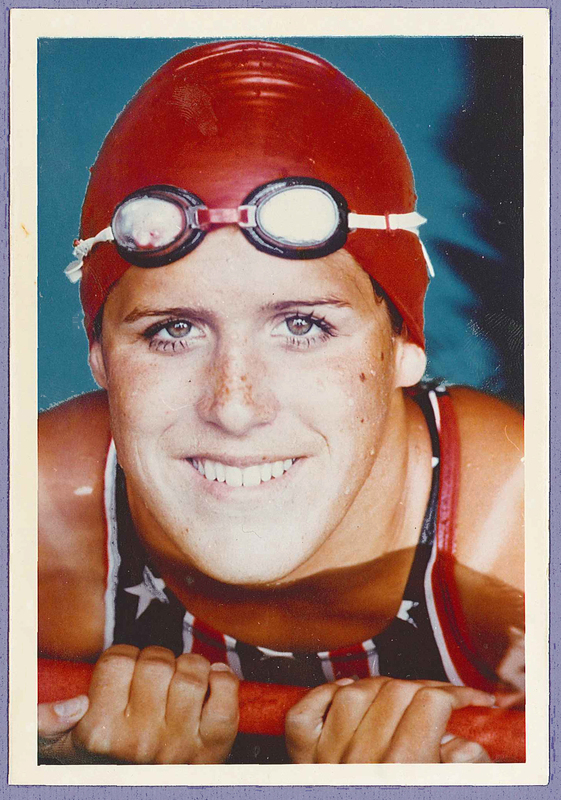 She met her husband Drew McDonald at Stanford, who was a member of the 1984 Olympic Water Polo Team. On December 13, 1986, a month shy of her 30th birthday, she died as a result of an inoperable brain tumor she’d battled since 1979. 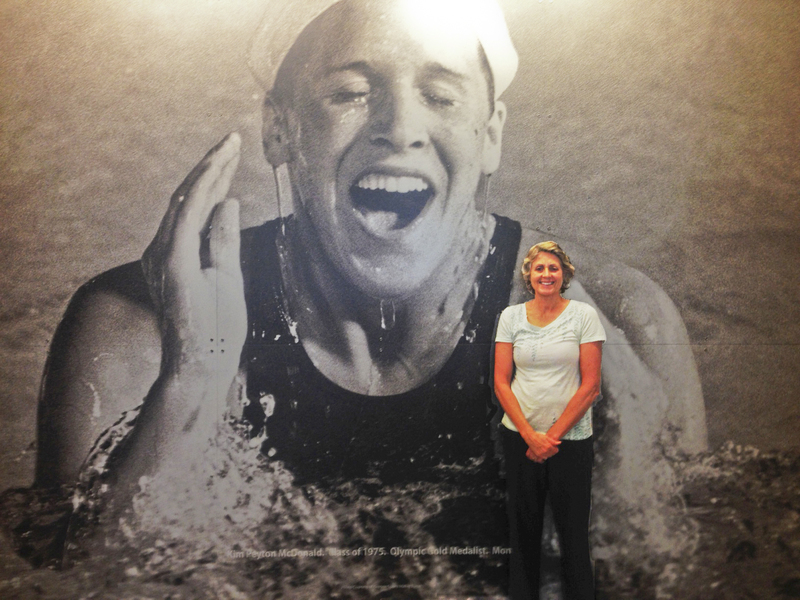 In 1989 she was inducted into the Oregon Swimming Hall of Fame. You can find several postings of the 1976 — 4 x 100 women’s free relay and “The Last Gold” movie trailer on YouTube.